The color is nice, material is feels good to the touch. The sheer light was exactly what I expected. The size didn't fit my window but it has a little fabric folded at the bottom that i can loose it up and make it a little longer to be at the perfect height for my window. I have to order 2 more as they are not too wide. I like that I can make it work for my window. The gold color with the silver design is very beautiful. Love it. 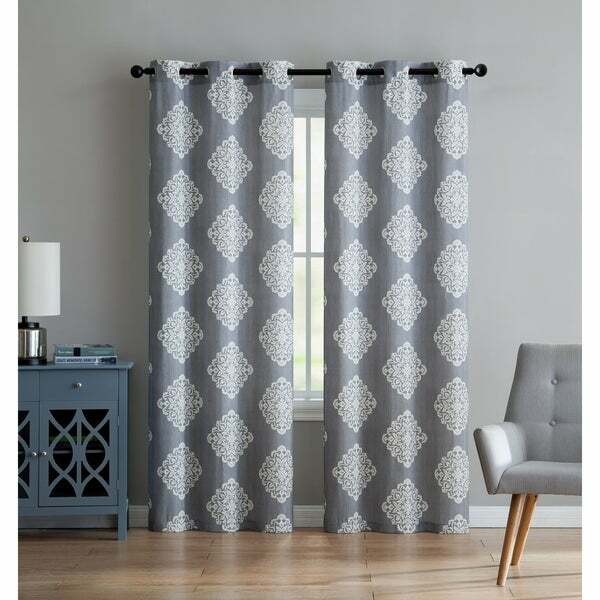 The Aria Printed Panel Pairwill add a stylish décor to your window pane. The medallion print will bring depth and dimension to your home. Dimensions 28.0 In. X 16.0 In. X 1.0 In. Option: Gold - 38" x 84"
This are very pretty but the color is more taupe than gold. Nuce quality- metallic gold is printed on. I just didn’t like the color. I would recommend, though. Option: Gold - 38" x 108"
Option: Grey - 38" x 96"
it never ceases to amaze me how pleased I am with the products that I order from Overstock! The quality, color and fit turned out to be about as close to perfect as it can be. It I needed more of these I would definitely order these! Option: Taupe - 38" x 96"
Not impressed. They are much darker than they appear online, and more sheer than i expected. I returned them. Unfortunately this was my first purchase from overstock in a while. I likely will shop elsewhere, given their return policy compared to other sites.